Secure your home in the event of power outages, damaging winds, storm surges and flooding. Food – Turn your refrigerator temperature down and/or freeze any food or drinking water. Put a Hurricane Kit in your car ahead of time in case of mandatory evacuation. A Hurricane Kit contains the same items as listed below in What to Have below. Health/Safety – Your health and the health of your family members and pets are of the utmost importance. The Center for Disease Control (CDC) has a helpful guide on how to stay safe during a power outage. 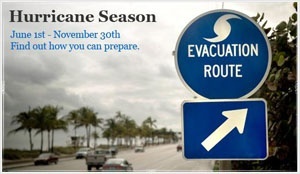 Practice hurricane safety by being prepared for risks. Visit National Hurricane Center for more information.